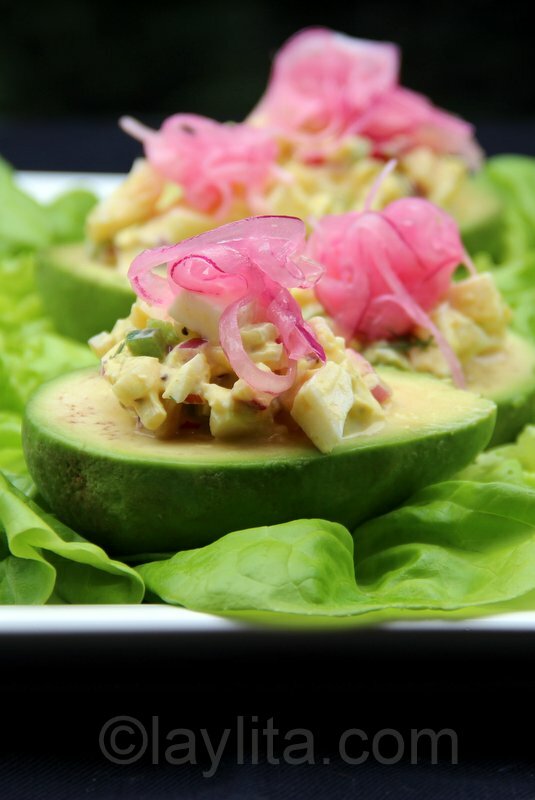 This egg salad stuffed avocado recipe was prepared using delicious ripe avocados and stuffing them with a salad made with hard-boiled eggs, radish, red onion, celery, mayo (and/or yogurt), mustard, lime juice, cumin and jalapeños. 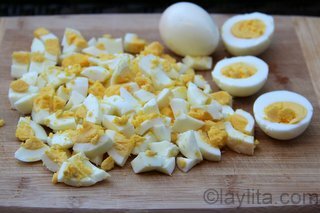 I made the egg salad dressing with a combination of mayonnaise and yogurt, you can use only yogurt if you prefer. I also added a diced jalapeño, this is optional and you can leave it out or use a bell pepper if you don’t want the extra spice. 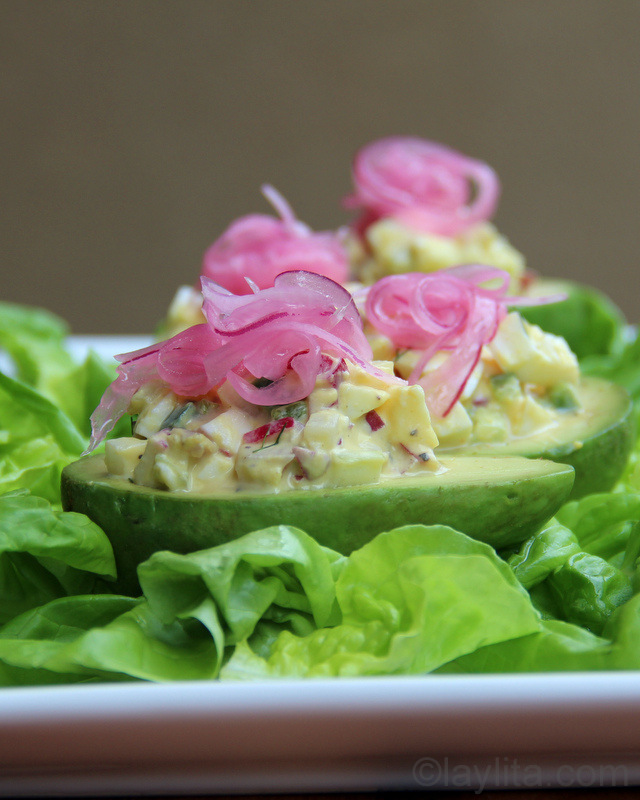 Egg salad stuffed avocado recipe prepared with ripe avocados and stuffing them with a salad of hard-boiled eggs, radish, red onion, celery, mayo (and/or yogurt), mustard, lime juice, cumin and jalapeños. 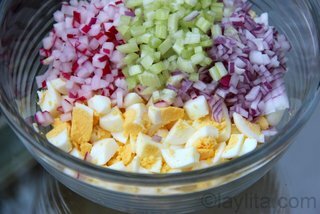 Combine the diced hard-boiled eggs, radish, red onion, celery, mayonnaise and/or yogurt, mustard, lime juice, and cumin powder in a large bowl. Mix well. Add the diced jalapeño (if using) and salt/pepper to taste. 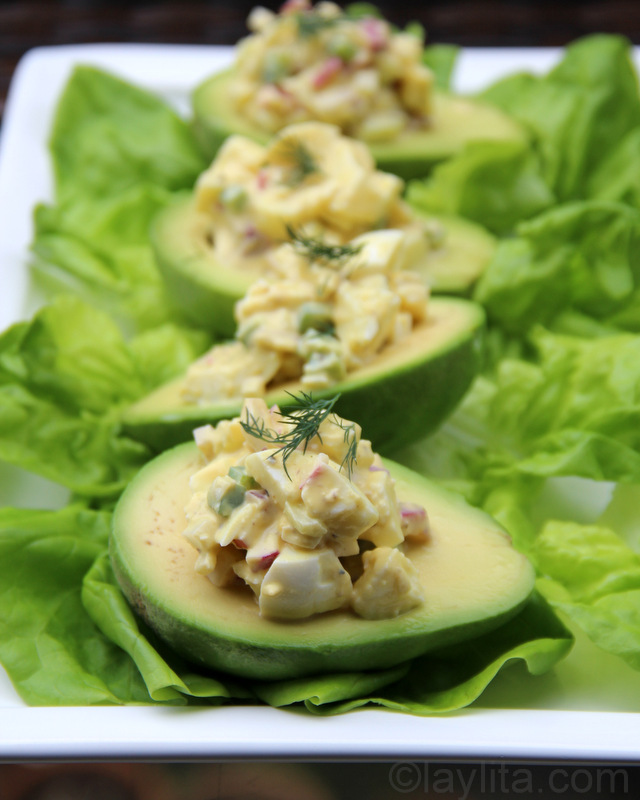 Use immediately or save the egg salad in the refrigerator until ready to stuff the avocados. 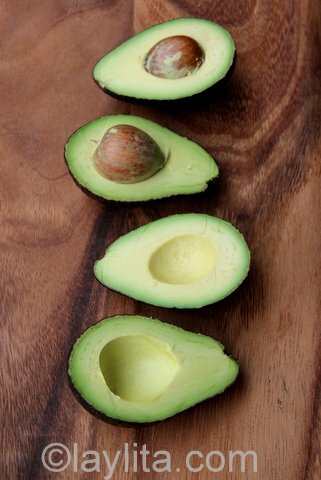 Drizzle the peeled avocado halves with the lime juice, this will slow down the darkening process. 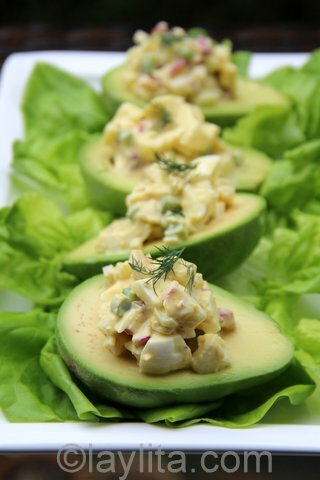 Stuff the avocados with 1-2 spoonfuls of the egg salad. 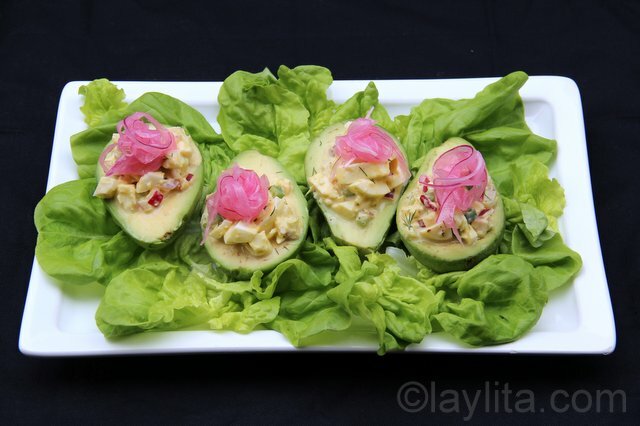 Place the egg salad stuffed avocados on top of lettuce leaves. 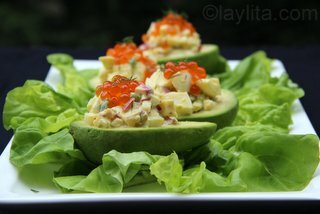 Garnish with your choice of fresh dill, salmon roe and/or red pickled onions. 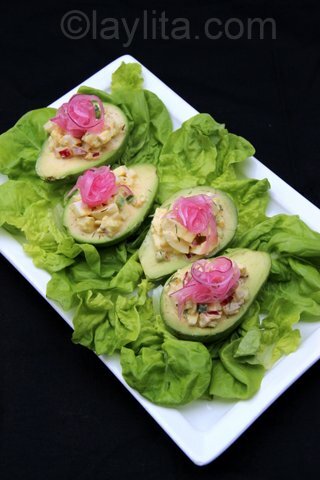 I served these stuffed avocados on lettuce leaves, and garnished them with dill and pickled red onions or salmon roe. 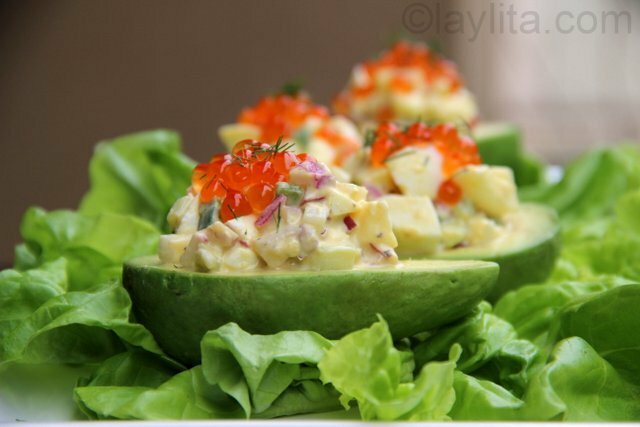 Salmon roe are the eggs of salmon, sometimes also called caviar – though food snobs will say it isn’t caviar. You can find them in the fresh seafood section at many grocery stores and most fish specialty places usually have it as well. 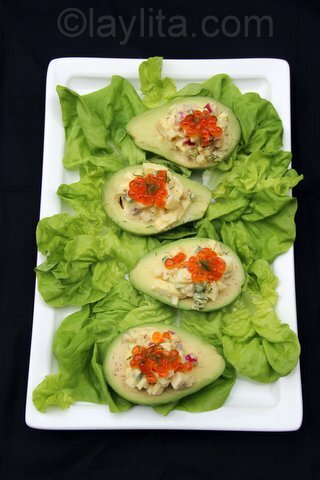 Salmon roe is one more affordable type of “caviar”, the price varies from one store to another. For those in the Eastside Seattle area, at the International Deli (a Russian deli) in Bellevue you can buy 16 ounces for less than $20, while at Metropolitan Market or Uwajimaya you pay about $10 for 4 ounces. 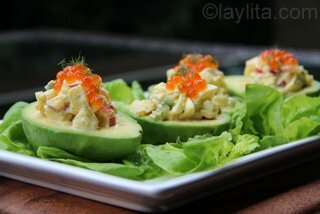 The salmon roe provides a nice briny flavor to the egg salad stuffed avocado and adds a bright color touch. 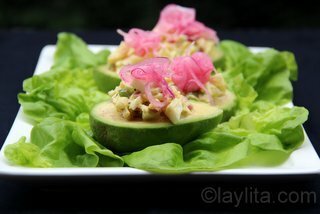 If salmon roe isn’t your thing, I hated it as a kid, or you want to prepare this as a vegetarian dish, then you can also garnish the avocados with cebollas encurtidas or lime pickled red onions. The simplest garnish is a sprig of fresh dill – or your favorite fresh herb. 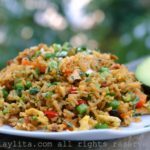 When it comes to using leftovers from holidays my favorite thing to do is stuff them into something, usually it’s either an empanada or an avocado. In this case, using all the hard-boiled eggs left from Easter seemed like something that would go better stuffed in an avocado. 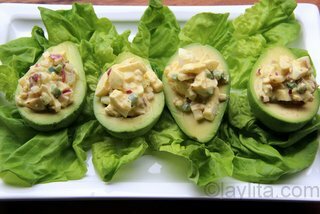 Yes, I could have used some slices of hard-boiled egg for beef empanadas, but I was craving the creamy delicious taste of egg salad stuffed in a fresh avocado. 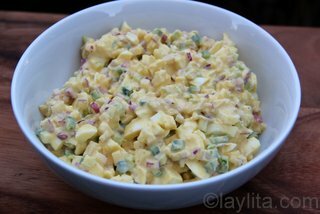 The salad can be made ahead of time and kept refrigerated until ready to use. 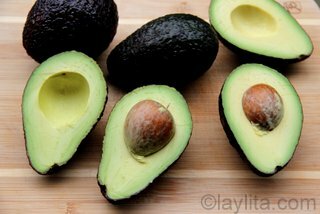 Cut and peel the avocados right before you are ready to serve. 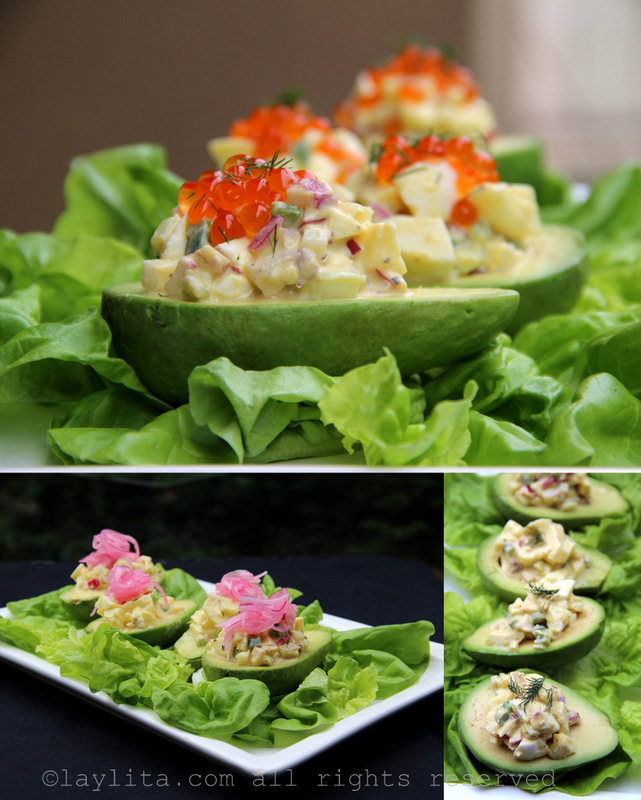 You can serve each person 2 stuffed avocado halves as main salad dish, or 1 avocado half each as an appetizer. 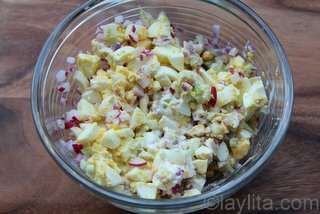 If you’re out of avocados, this egg salad can also be served by itself, on lettuce leaves or as topping for crostini or toasted bread slices. I have to tell you something that just happened. I was at my favorite store Crate & Barrel buying some platters and things when I started talking to the sales girl and she asked me what I need the platters for. I told her I was a personal chef/food blogger and she asked if I knew Laylita and of course I do. Just wanted to share this with you. I did tell her that I fpllow you and she said you were fantastic and what she has prepared from your blog is always to the point. Hi Norma – Thanks for the story, that’s very flattering! 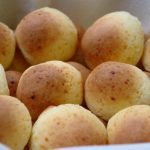 Un abrazo!